Everyone loves cheese. And because I’m French, I especially love cheese. Ah, le fromage! I wanted to write a post paying homage to the art of the cheese board. A cheese board is so much more than just cutting up some bricked cheddar and mozzarella, putting out some crackers, and setting it on the table. I mean, that’s just cheese and crackers, plain and simple. Most people know that, and that’s why creating a cheese board can be an intimidating venture. Cheese boards should be carefully planned – from flavours to positioning. Okay, maybe I’m being a bit of a cheese board snob here, but you know that you hum and haw when arranging one. This is part of the process. We all want our cheese boards to look like the dozens we’ve seen on Pinterest. I will start off by saying that I strongly recommend avoiding chalkboard painted surfaces for your food. I know it looks pretty and rustic, what with the chalkboard writing in front of each item to identify it. It’s just…it’s not healthy. Lead, people. LEAD. So, unless you have your food sitting on top of something protective, or unless you have a death wish, avoid the chalkboards. Wooden planks are ideal, but large, plain cutting boards can work, too. When it comes to choosing your cheese, you want balance in every which way. Different flavours from mild to strong; different textures; varying colours; an assortment of shapes. The best place to start is a reputable cheese counter, or the “fancy cheese” section of your local grocery store. The best part about a cheese counter is that the cheesemongers typically have no qualms with letting you try a small piece of what you’re interested in. They can also be a great help in pairing flavours and getting you started with your cheeseboard strategy. How un-cheese-snobby of me, I know! Anyway. Follow whatever arrangement you’d like, I’ll just exemplify mine. Aged cheeses are easily recognized for their texture, odour, and taste. With age, cheese tends to become harder and more crumbly. The flavours are strong and salty, so a little goes a long way. Some good aged cheeses to consider are Cheddar (close to six months and up to seven years), Asiago (depending on the type, some Asiago is aged to three months, and others, all the way up to 18 months +), Romano (5 to 12 months), Parmesan (10 to 24 months +), Swiss (3 to 4 months), Gruyere (7 weeks to 3 months), and if you’re into blue, Roquefort (2 to 4.5 months) is decent, and even I can swing that one. *Please note that the above time frames are approximations based on my own research and may vary. New cheese would be, well, basically the opposite of the aforementioned. Fresh, milky-white, light in body, texture, and flavour. They also have a much higher moisture content. Some nice new cheeses to consider are Chevre (goat cheese, which is offered in many different flavours, so you can have fun here), Mozzarella, Burrata, Marscapone, and Bocconcini. Smoked cheese will be the death of me, because I could eat it until I burst. Smoked cheeses are, hands down, my favourite cheese. 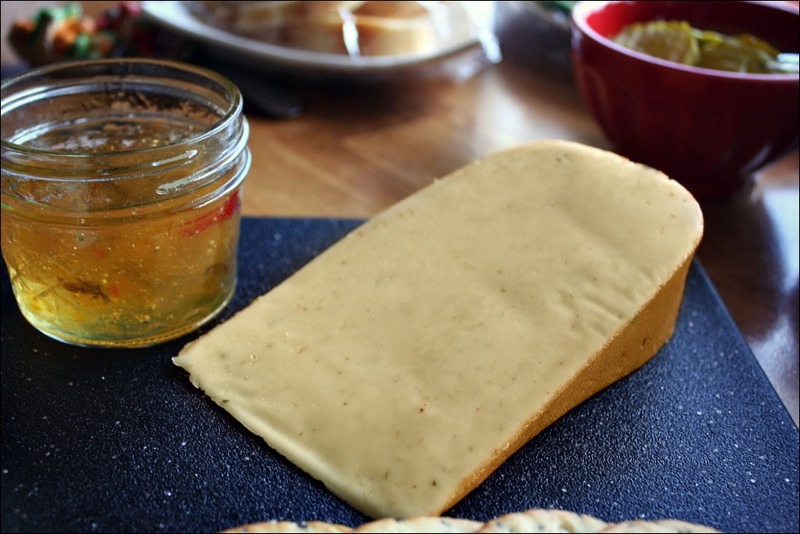 They make an impression on a cheese board, and man are they ever good in a fancy grilled cheese sandwich. Any smoked cheese is specially treated by smoke-curing, and as a result, it has a golden/brown outer pellicle. Smoke-curing can be done two ways: hot-smoking and cold-smoking. However, in less expensive cheese, sometimes artificial smoke flavouring is used for flavour. In this case, food colouring is used to give the cheese that traditionally smoked appearance. So, if you’re looking for quality smoked cheese, be sure to read labels and/or ask questions. My personal favourite smoked cheeses are Smoked Cheddar, and Smoked Gouda. There are tons of different variations of smoked cheese, though. When it comes to arranging a cheese board, I’ll either go aged cheddar and smoked gouda, or aged gouda and smoked cheddar. If I have the room, I like to add a nice flavoured Havarti or Pepper Jack. With this particular cheese board, I chose a dill Havarti. A cheese board certainly is ornamented with cheese, as the name suggests, but not cheese alone! Sweet and salty accompaniments are a must – from crackers and mini-toasts to artisan breads; nuts, olives, meats, and jams! Choose accompaniments that best suit the cheeses you’ve chosen. Aged cheeses are wonderful on their own, but they also pair wonderfully with salty goodies like Greek olives and cured meats, and they balance nicely on artisan breads or plain-tasting crackers. New cheeses are more flexible when it comes to flavoured pairings. Seedy and/or flavoured crackers can really accentuate a mild and smooth mozzarella or plain chevre. Though, you could also jazz these up with drizzles of balsamic vinaigrette or a chutney of some sort. Adding some heat with hot peppers can also be a nice option. The milkiness of a fresh cheese can take the intensified heat of a hot pepper and really smooth it out. Homemade Red Pepper Jelly, and homemade peach and habanero jam (both to die for). So, in case you couldn’t tell, I’m a true Brieliever. And that’s about it. Not too complex, right? Pick your cheeses, pair up appropriate accompaniments in the form of meats, salts and sweets, some crackers and breads to place them on, and voila! You are a master in the art of the cheeseboard! I’m not going to discuss wine pairings today, though. That’s an entire post on it’s own, and for another day. Such a necessary post, I really love cheese! I look forward to the wine pairing post... I'm not great at that kind of thing. I also LOVED the jelly discussion -- who knew you could get peach and habanero jelly? Thanks! I'm so glad you enjoyed the post. The peach and habanero jelly was made by my fella's talented mother! It is SO good. I'm definitely going to be making jams and jellies this late spring/summer and that will be one of them! The sweet and spicy in that one is to die for. Hey, sometimes a simple plate of cheese and crackers is a perfect quick and easy snack to satisfy a cheese craving :) I have a bit of an obsession with cheese boards, though. (Could you tell?) I'm so glad that you enjoyed this post and when you do get one together, I'd love to see! And trust me, I can often be found by the cheeseboard at social gatherings, being anti-social. Eating one for dinner sounds like a dream! Such a necessary post, I love it. Cranberry cinnamon goat's cheese is interesting.. Thanks so much for your feedback, Maria! The cranberry cinnamon goat cheese really is interesting, and really tasty. Much like how jellies, honey, etc. work for brie. I love how flexible goat cheese is, though. It seems like it can be paired with just about anything! Fruits, vegetables, and herbs!